Does grocery shopping ever give you a headache. Standing in a store aisle trying to determine which item is the best value or the lowest price per unit of measure can be frustrating! Value and worth are not solely evaluations based on money. Someone or something is of value when found to be important or useful. Worth can be given to someone or something that is found to be important or deserving. We struggle to find our value in the world. We fight to be worth something. While a price measured in dollars doesn’t apply, we attempt to find a measure that will… if we have enough friends… if we achieve status in school… if we please our boss… if our children are well behaved… if we have enough followers on instagram… if we have a stellar performance on the field… if we do enough for God… then… then will we be of great value? Will we be of great worth? See this receipt here? 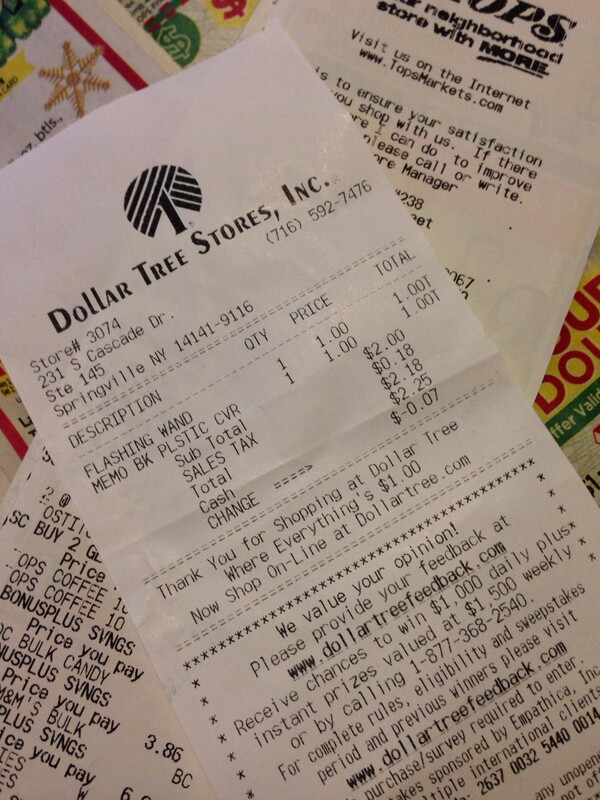 It may seem silly to jump to a dollar store purchase and yet… that’s where we’re headed. Isaiah celebrated his 8th birthday right before Thanksgiving and he was happy to receive some money. Now, you should know, cash is a greatly desired item amongst my children. However, they suffer from the inability to keep track of it. One reason: they often misplace it. Second reason: their siblings find what they have misplaced (or left unguarded) and take it. In an amazing turn of events, Isaiah managed to keep his money for more than a week. And FINALLY (emphasis his) we took a trip to town and he was excited to go to the dollar store to make a purchase. After a time of weighing his options, Isaiah chose two items and happily went to the register and become their proud owner. They became prized possessions, which to be honest, seemed silly because they came from the Dollar Store. What looked like to have little worth to me was of great value to him because he bought it himself. How great is our value to the one who bought us with His life. I may not ever be truly able to understand the love of the Father for us… How God, who knows the full truth of us… not the cleaned up mess, the Sunday smile, the out-in-public-behavior… But God , who knows the full extent of us, loves us. Many of us struggle with calculating our value and worth because we often find ourselves coming up short. Short of our desires, short of others’ expectations, short of what we believe God wants of us. Because someone will always have more friends, more likes, more accolades, an easier life, a greater reputation, better gifts and talents. Your value isn’t in what you do. Your value is found in Him to whom you belong! Scripture says Christ “gave his life as a ransom for many,” that we were “bought with a price” because of His LOVE for us! Love is the trump card when it comes to value and worth. You are LOVED by God. That is a value beyond reckoning, worth beyond measure and peace which passes all understanding. In the second week of Advent we focus upon peace. We long for lasting peace but continually struggle to find it. Through the atoning work of Christ peace has come. This Advent season, as we prepare to celebrate the coming of our Savior, how do you need to set aside your personal evaluations of your value and worth and embrace peace that comes through identity in Christ? Because when our identity and worth is grounded in Christ our peace has staying power because HE is everlasting! This lesson is so important and I am constantly relearning it. I’m a real people pleaser, always wanting approval of others. That never works out so well. I am always left disappointed and empty and feeling useless. But when i seek God’s approval while trying please others, and listen to him for who i am supposed to help and what i am supposed to do, it always feels like i am the most amazing person in the world! Jesus rules everytime.